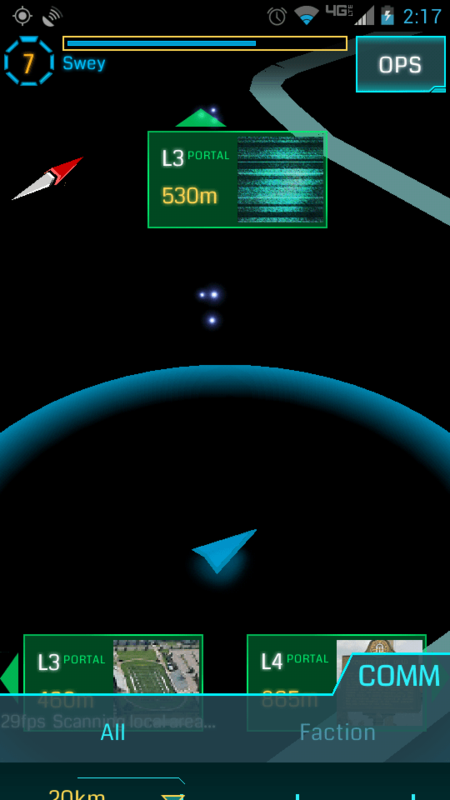 Exotic Matter is the driving force behind all of our actions in Ingress. XM allows us to construct items through hacking portals, to attack enemy portals, make links, and create fields. But how much do we really understand about it? We have been researching XM for some time now, but because the nature of Ingress is change, it’s difficult to pin down concrete stats, in this article we’ll do our best to share what we know so far. Each collection of XM consists of 3 white dots revolving around an invisible core that must be interacted with to collect it. Each core has an energy amount ranging from 35-100 XM. Look at the cute little XM! XM concentration away from portals seems to come from Location Based services, meaning that areas with a lot of foot traffic have higher amounts versus places that don’t. Verizon stores, Parks, and Intersections with red lights also have higher than average amounts. While Highways and Roads tend to have less. A Verizon store, with close to 4,000 XM around it. Here’s where it gets complicated; the XM around portals varies based off of the portals level that it surrounds. The portals true level is then multiplied by 1000, so that same 4.5 portal would have ~4,500 xm around it, this value fluctuates up or down by 100-300. A portals true level is also handy for predicting what level items will be able to be hacked. A 4.75 portal will give more level 5 stuff than a 4.12 level portal. While Portals ranging 5.5-8 still use their true level to calculate the XM cloud, the values are a bit different, the XM concentration begins to fall and each level only increases the XM by 500-750, so a level 6 portal would have 3,000-4,500 XM in the area around it. Portals in close proximity to each other sometimes have overlapping XM fields making calculating the XM received difficult. In closing, knowing how much XM is around each portal can be handy for preparing for attacks, defending portals while out and about, and saving supplies. Why waste a Power Cube when you know those two L6 portals up ahead are gonna recharge your scanner for the next attack? Thanks again to Evil Witch for her help in researching this article. Bandito Bunny also helped with the preliminary knowledge into the nature of XM. So if your description is right, then a L6 Portal should spawn 3000 – 4500 XM and not 3000 – 3500 XM. Thanks Martin and Saithis, fixed the math, and I agree Pen, but its what our research has turned up, if you have other findings please let us know. I think it’s to keep Power Cubes in play and also for the game to not have to keep up with an XM cloud of 8,000 and we will be covering that in later posts, Soeren, we’ve seen clouds refill as soon as you walk away after deploying, and after recharging. Non-monotonic increase in spawned XM around a portal doesn’t sound logical. This looks like some wild guessing, not like solid research. 1) A Level 4.75 will not give any more L5 kit out than an L4. 2) XM levels around a portal are nothing to do with portal level but how charged the portal is. A fully charged L1 portal will give the same XM as a fully charged L8 portal. teapea 1 – needs detailed research, 2 – from my own experience I believe you are wrong. Agreed! I’ve sen that after deploying/upgrading (when portal gets a lvl up) and walking away, it respawns XM. Also, XM spontaneous respawn occur every 17~20 minutes. This is very importan to plan maintenance: a daily L6 Portal decay rate consums from 5 to 6k and keeping a L6 farm up to its fullest (say 15 portals) uses about 100kXM. Game Logic Breaking News: 5 New Portal Mods!